My journey as an artist started as a child and is constantly evolving. My father is a painter and graphic designer (and in public opinion can do ANYTHING). My sisters and I spent hours watching and learning from him and headed in our own directions with art. I spent my college years soaking up all different mediums in the art program at the University of Mary Hardin-Baylor. The studio I couldn't stay away from was, surprisingly, Ceramics. I had a fantastically eccentric and deeply interesting professor, the late Phil Dunham, and with him my passion for clay grew and grew. I immediately went into teaching at the high school level in a Houston-area school. My environment was undeniably unique, and I don't take one minute of my teaching experience for granted. The district I worked for was actively involved in the Rodeo Art and area competitions for students to win awards and money for college. In doing that, I spent countless hours researching new and old techniques to keep the students current and interested. Meanwhile, I was exploring so many new things that my own work took on a life of its own. After six years of teaching Pottery, Art, AP Studio, and Graphic Design, I decided it was time to move on and explore my own path as an artist. 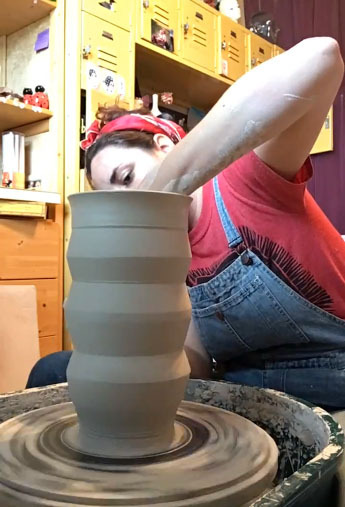 I am now a full time potter working from my home studio north of Houston. My passion for clay is a love story, and I am so thankful I'm allowed to live it every day. I can't wait to see where this clay world takes me! I predominately make functional items, all wheel-thrown and hand-decorated stoneware. I've always been told my work is not traditional, and although at first I was apprehensive, I've grown to appreciate that. I'm not like everyone else, and that's a GOOD thing! I've always enjoyed trying and applying new techniques and color schemes and will forever work in that manner. I most enjoy creating custom functional work and doing my best to build bridges between a customer's vision and the final product. A handmade mug is the type of piece capable of telling a multitude of different stories. From the many hands that hold it, to the years of life and early mornings it witnesses, a mug is special, lucky enough to also be a piece of art.